You’ve purchased your first round of Pueraria Mirifica supplements and you’re excited to begin, but…where do you start? Each brand of Pueraria Mirifica supplement seems to suggest a different starting date and a different dosage and it’s easy to feel confused. 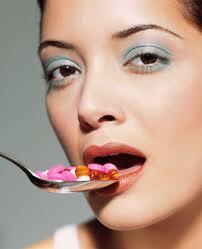 The two most common questions that come up regarding taking Pueraria Mirifica are listed below. How much Pueraria Mirifica should I take? First of all, keep in mind that herbal supplements are not an exact science and the source you should listen to first and foremost is your own body. With that said, we at MGB believe you should start out with small doses of Pueraria Mirifica (yes, less than the usual dosage suggested by the majority of the Pueraria Mirifica sellers) to allow your body to adjust to the strong hormones and then gradually feel your way into higher doses. We strongly recommend starting out on a lower-than-recommended dosage to give your body time to get used to the hormones as well as to see how much you really need to grow. When I personally started taking PM, I started with 100 in the morning and 100 in the evening on the FIRST DAY of my period. Around the third day, I upped it to 200 in the morning and 200 in the evening and kept it that way until my period ended. During my luteal phase, I used a progesterone-based cream to grow and took no PM. When should I start taking Pueraria Mirifica? Again, there are varying opinions on what day of your hormonal cycle Pueraria Mirifica should be taken. Some manufacturers say you can take the supplement throughout the month, some say the first 15 days of your cycle, and yet others say the complete opposite. And again, there is not one correct answer. Each individual body is different and it is most important to find out what works for you. With that said, we would like to provide a little bit of background information as to why each of the differing schedules exist. Here’s why: Three key hormones are associated with your cycle – estrogen, testosterone, and progesterone. Because these hormones follow the same pattern every month, you can accurately predict which ones will be predominant on any given day. The average cycle is 28 days, although yours might be shorter or longer. 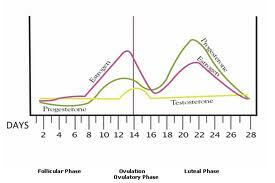 The simple chart below shows the typical hormonal pattern for the average menstruation cycle. As you can see, this is the simple snapshot of what your hormones are up to all month. Starting from the first day of your period, estrogen levels begin to rise little-by-little until it peaks during ovulation. This first period of rising estrogen levels is known as the Follicular Phase and this is the period of time that is recommended by some as the best time to take Pueraria Mirifica. The reason why people advocate the taking of Pueraria Mirifica during the first 15 days of your cycle is that since the phytoestrogens present in Pueraria Mirifica are to serve as additional estrogen in your body, it makes sense to introduce the additional estrogen alongside the body’s natural boost of human estrogen. Also, since it is progesterone that should be dominant in the second-half of your cycle – the Luteal Phase – it makes no sense to interfere with that by introducing excess estrogen. Advocates of this first method also recommend adding a progesterone-based breast enhancement cream to enhance the effects of progesterone during the luteal phase. Still, others recommend that Pueraria Mirifica should be taken in the latter half of the cycle, after ovulation and during the Luteal Phase. The reasoning behind this is that introducing excess estrogen – on top of what the body is naturally producing – can either overwhelm the body’s estrogen receptors and be counterproductive OR that the extra estrogen will be too much for the body to handle and worsen PMS and menstrual cramps. These Luteal Phase advocates reason that since the body’s production of estrogen decreases during the Luteal Phase, it makes sense to supplement what is reduced with a potent phytoestrogen. Still yet others recommend that Pueraria Mirifica can be taken regularly, everyday, just as any other supplement. The basis of this reasoning is that that was how it has been consumed by the Thai population for over a century and it has had no adverse side effects. In fact, Thailand has one of the lowest incidents of breast cancer in the world. Advocates of month-long Pueraria Mirifica claim that the whole argument between whether the Follicular Phase or the Luteal Phase is best for Pueraria Mirifica is based on cycles that are meaningful for contraceptives but inapplicable for Pueraria Mirifica. So, there you have it. 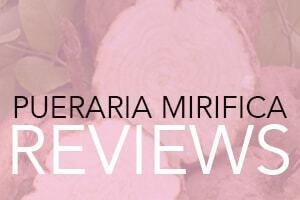 The 3 most popularly recommended ways of taking Pueraria Mirifica. Our recommendation? Listen to your body, experiment, observe, and choose what works for you. should we stop eating after 6 months. What is the recommended PM regimen for someone who is on a contraceptive that completely suppresses ones’ period? Should she still follow the 15 day cycle?